Cultural Landscapes Blog›Which role for hunting, angling, and gathering wild products in landscape stewardship? Both cultivated food and wild food are important carriers for cultural heritage. Nevertheless, wild food has a broader role in connecting people to the cultural landscapes they live in. First of all, wild food is commonly provided on a very local scale. Cultivated food products are commonly traded on a globalized market, while for collecting wild plants, mushrooms, or game people commonly travel a few hours maximum. Secondly, collecting wild food involves a range of traditional and local knowledge, on, for example, taste and palatability of plants, identifying plants in the wild, knowing where to find them, and navigating in the landscape. Collecting wild food is an appreciated activity. A previous study indicates that at least 14% of the European population collects food from the wild while at least 25% consumes wild food. In some countries, wild fruit comprises a considerable part of the fruit consumption, but for most of the people, wild food collecting is not a necessity for acquiring nutrients. Mostly, people collect wild food as a recreational activity. They like being active outdoors. Picking fruit, vegetables or berries or hunting makes people feel connected to the landscape, and many appreciate the collected food as ingredients for traditional dishes. Currently, two trends on wild food collecting can be observed in Europe. On the one hand, in many countries wild food collecting is a traditional activity, mostly done by the elderly and hardly transferred to younger generations. In these cases, the tradition and the traditional knowledge associated with wild food collecting is at risk. In other regions, mostly affluent and urban areas, on the other hand, ongoing globalization is believed to trigger a higher appreciation of the own region. In these regions, a re- appreciation of wild food in restaurants is seen, as well as local initiatives to teach people again how to collect and use wild food. 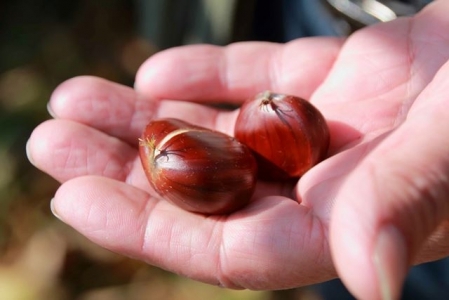 For example, in the Netherlands, where there is little traditional wild food collecting culture, over the past years "smulbossen" (banquet forests) have been established, where citizens could collect walnuts and fruits for their own use. gathering wild food is one of my great passions, and have been lucky enough to be involved with foraging in four European countries including the U.K others Romania, Bulgaria and Sweden. The U.K population are warming to the notion again, but are inherently afraid of anything not packaged and labelled, homogenised, pasteurised and grown in the most nutrient poor soils! Sadly the U.K has been beaten into submission by generations of foodies who insisted and declared all English food as something to be forgotten, a greater disservice hard to imagine, and why the traditional fair has been almost lost. Where would old Blighty be without a Bramley apple pie, Blackberries, Slow Gin, etc. Wild foods are indeed very important for heritage; from a landscape perspective, their conservation also results in the retention of non-food species. It is also important to remember that saving species and habitats also requires the local knowledge to exploit them. I think we should add this important resource to landscape issues Hercules is already studying.